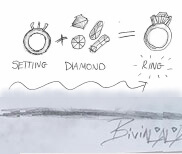 Choose the type of jewelry you want to start designing. Choose the diamond to complete your jewel. We will make it !! I have recomemended the service to many friends and colleagues.